Imagine my thrill to see Roald Dahl and Ernest Hemingway walking alongside one another, pictured in my galley copy of Love from Boy, a collection of previously unpublished letters from the beloved children’s author to his mother. For me, this was another moment of chimes sounding, so to speak. I hadn’t realized these two had any contact; I guess I hadn’t thought much about their contemporaneity. 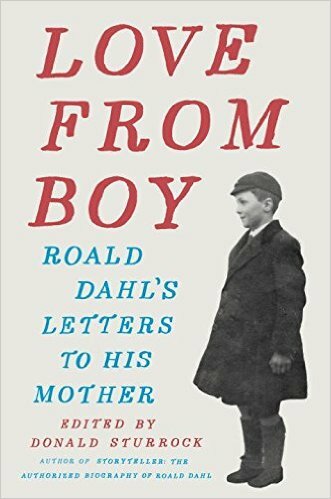 What fun to find that Dahl – one of my favorite authors when I was a kid – shared my appreciation for Papa’s work. Strange and secret man, indeed. I was also interested to see Hemingway looking quite short and fat, next to the tall, thin Dahl. I’ve seen a lot of pictures of Hem: mostly the flattering ones he liked released; fewer in which he appears fatter and wearing his glasses (which he generally avoided being photographed in). While he is a perfectly distinguished-looking man here, in a suit and tie and those offending spectacles, both hands in pockets, striding purposefully across a street, beard clearly dark-going-to-gray (even in black and white) – I suspect this is not a photograph he liked. This one, taken during his third marriage, to Martha Gellhorn, hearkens to a slightly older Hemingway. I love that there is always more to know. Teaser Tuesdays is a weekly bookish meme, hosted by MizB of Should Be Reading. hemingWay of the Day is my own. 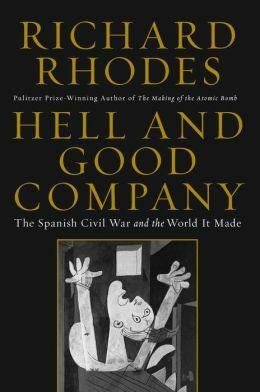 I was drawn to Hell and Good Company because of my interest in the Spanish Civil War, which in turn was born of my love of Hemingway, of course. So it’s natural that I’d be drawn to the lines that concern him. Sorry I’m so predictable! Hem is not the main star of this book – far from it – but I had to share these few lines. I like this for its dry humor, but also for its evocation of the strange circumstances of the war in Madrid: that life was carrying on, that Hemingway and others were visiting the front & literally dodging bullets by day and holding champagne parties by night in this hotel, where the best rooms had become the worst but otherwise things were carrying on. This captures Hemingway nicely, and perhaps what draws me back to him as well: that he is so macho, so obnoxiously obsessed with being his own hero, also has that sensitivity & artistic talent, but feels the need to hide it. There’s nothing so fascinating to me as that interior conflict. Of course, stay tuned for my review of this book, which I assure you (despite the above) is not nearly as Hemingway-obsessed as this blogger is. My favorite bar has an every-Tuesday-night event called Imperial Andy’s Historical Cocktail Tuesday. Andy is my friendly British bartender. He finds a historical event coinciding with each Tuesday’s date, makes up four themed cocktails to go with it, and produces a one-off menu telling the story. 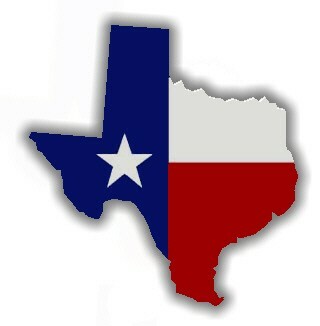 I have long wanted to be a part of one. Many months ago I used the book my mother gave me (for Christmas? ), A Reader’s Book of Days, to find a Hemingway event: July 8, which fell on a Tuesday in 2014, was the day (night) he was injured in WWI, which led to his meeting the nurse he fell in love with, who would jilt him, who would be the model for the novel A Farewell to Arms for which he is so well known. This event would also be a big part of his self-myth. I’ve had my short write-up of this historical event and its significance waiting since maybe January for July to come along so I could cue Andy to do a cocktail list for it. Obviously the possibilities are endless! Well, I ended up having an un-reschedule-able appointment on that Tuesday evening; I was pretty disappointed. But the week before, I dropped my piece of writing off with Andy anyway. He’s become a great friend. I said hey, if you use this, would you just save me a copy of the menu please? He said he would push the historical event back a week if I could make the following Tuesday! Which I could. I enjoyed the drinks. And while we talked over drinks, we somehow came around to the concept of the green man. I told him Kingsnorth’s story as I remembered it offhand from an article my father sent me some months back (Andy being logically at least a little interested as a historical cocktail man as well as a Brit), and I sent him the link to the article too. And then, just on a whim, I looked up the date of the Battle of Hastings: October 14, 1066. Guess what day of the week October 14 falls on this year. You got it. 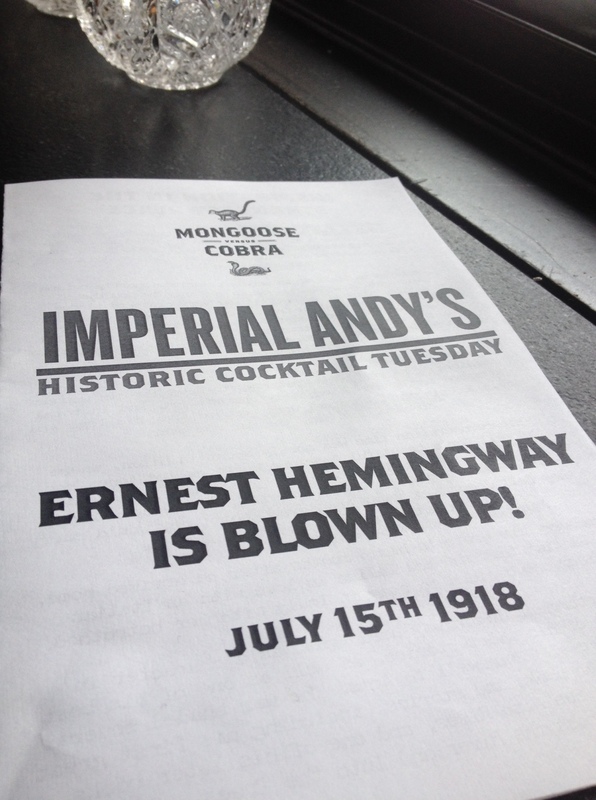 That will be another Imperial Andy’s Historical Cocktail Tuesday. Too bad that’s not the week my father was planning to be in town… maybe he can reschedule. Today for giggles and deprecations: How To Tell If You’re In A Hemingway Novel. Enjoy. From what I think might be an underappreciated and understudied Hemingway novel: The Garden of Evil. I know one person who I love very much who I think might be just too smart and wise to be happy. These words ring true. But hopefully also, intelligence can help us map a path through this quite depressing world we inhabit, towards happiness despite it all. That’s one of the things I really enjoyed about Derrick Jensen: his ability to show us how f*ed up everything is, and still find things to smile at.